I’m at the bar again at Apiary, checking in with the menu updates and tasting some world class pinot noir. Before this post, Ken Wright Cellars was already officially the most reviewed wine label here on WineGeist and I make no apologies for it. Ken Wright is an artist and I dig his work. 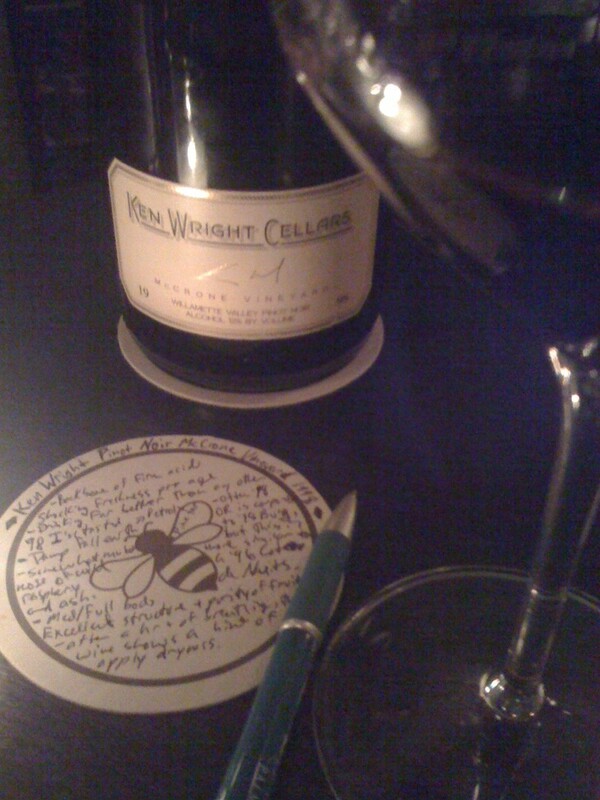 Most recently, I was floored by the experience of a Ken Wright Pinot Noir McCrone Vineyard 1998. Much pinot from that vintage in OR was a little off, and what was nice tended to age quickly. In this way, ’98 OR pinot is similar to the much maligned ’98 Cote de Nuits wines (Burgundy). Even in 1998 OR and Cotes de Nuits, as in all challenging vintages, great winemakers generally find a way to make nice wine. I’ve been reading (finally) Cash, Johnny Cash’s eponymous autobiography. I’m very near the end and am already planning to pick up Cash’s previous autobiography, Man in Black, if only to get the 3 or 4 stories he says are in it, which he didn’t feel like retelling in the more recent book. Cash also penned Man in White, a novelization of six years in the life of St. Paul the Apostle, which will not likely make the reading cue anytime soon. But back to Cash, by Johnny Cash: like him or not as a musician, a performer, or a man, but there’s an undeniable honesty to his tales and there just aren’t that many people who have ever been able to tell first hand tales of touring with Elvis. It’s been a highly entertaining read. Back to the Ken Wright Pinot Noir McCrone ’98, which turns out to be far more comparable to 1996 Cote de Nuits, which will likely prove to be the longest lived vintage for that region, of the decade. But we’ll discuss that in another 7 years or so. 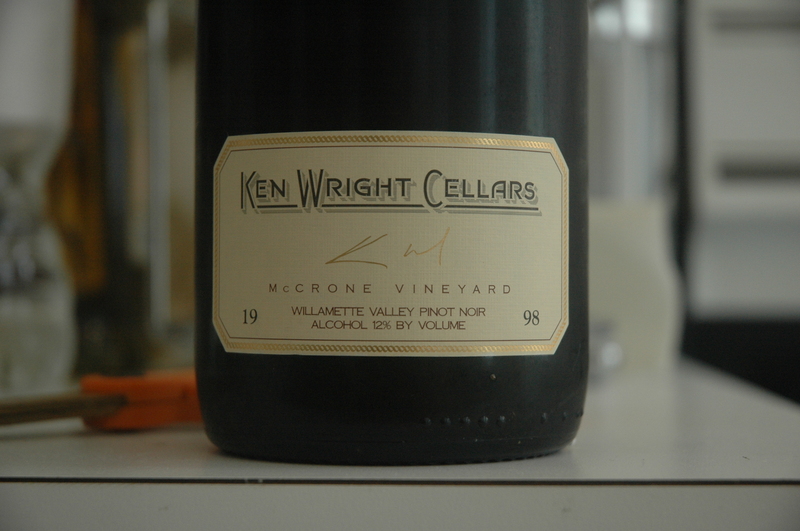 The Ken Wright PN McCrone ’98 is shockingly fresh for its age and has a long backbone of firm acidity. This leads me to order the Scottish salmon (yes, red with fish!) with asparagus, shaved fennel, trout roe, and white port beurre blanc, which paired swimmingly. The initially somewhat muted nose shows wild raspberry, black cherry, and ash. These notes pass seamlessly into the palate where they mingle with damp fall earth and a suggestion of petrol. After over an hour of breathing, a hint of apple dryness blankets the mid-palate. This is a nuanced wine of excellent structure and concentration that is drinking beautifully at over a decade in bottle.